From thousands of GIF images to viral YouTube videos, it is no doubt that cats are one of the most celebrated animals over the Internet. No wonder that the works of California based illustrator, Jenny Parks got viral not just by illustrating cute cats but re-imagining them as superheroes and other popular characters. The idea of transforming people to cats brought her a bit of Internet fame after illustrating “Doctor Mew“, cat versions of the characters from the sci-fi series, “Doctor Who”. Jenny has a BFA in Illustration and a graduate degree in Science Illustration, who is now based in San Francisco as a freelance illustrator making her own name in animal art and making a living by drawing cute and fuzzy creatures. Her cat heroes include characters form Batman and The Avengers. 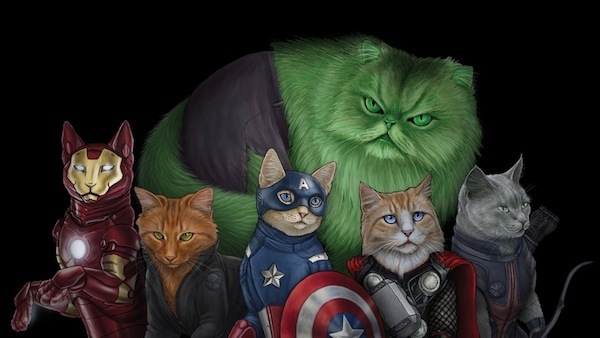 Some of the super-cats were even renamed such as Iron Cat, Hulkitty, Captain Catmerica, Purrlock Holmes, Catniss, etc. Check out some of Jenny’s cat heroes below. Enjoy! Which of the cat heroes is your most favorite? Check out Jenny’s official website for more information about her awesome illustration work. Share us your thoughts and suggestions by leaving a message below. Stay awesome everyone!